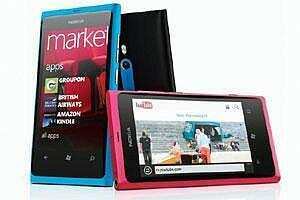 The Nokia Lumia 800 is the first phone born from the Finnish firm’s partnership with Microsoft, and it could well be the last chance Nokia has at being the leading phone maker. While the company is still doing well in India with a range of low-cost phones, the smartphone market has left Nokia’s Symbian handsets far behind, and the Windows Phone 7.5, Mango-based Lumia is instead a reworked Nokia N9. Does this really matter to users? Not significantly. We used a Lumia 800 for a week, and it held up well against other leading smartphones. The first thing that works for the Lumia 800 is its looks. It’s got the same body as the N9, and is one of the most distinct phones available. It’s available in multiple colours, and unlike the many iPhone-styled slabs out there, has a slightly curved profile, and lightly bevelled edges. The body itself fits into the screen so neatly that with a black handset, you really can’t tell where the screen starts. The polycarbonate shell looks great, is pretty hard to scratch, and feels reassuringly strong as well. The Lumia 800 performs well for most standard tasks—loading pages, using Twitter and Facebook, taking pictures and photo editing all worked perfectly. All these features are built into WP Mango, and don’t require the user to download apps. Apps also worked well, including most 3D games, although a few did cause it to stutter, just a little. On the other hand, loading Web pages, even with a lot of images and video, was a crisp experience. The lack of a front-facing camera for video conferencing is puzzling—particularly as even budget devices now come with this feature. The single core processor runs at 1.4 GHz, more than enough for any user—the phone doesn’t set any records with these specifications, but rather seems designed with realistic usage scenarios in mind. This, along with a power-efficient display means that the 1,450 mAh battery needs to be charged once every 24 hours. The Lumia 800 has a ClearBlack AMOLED screen, just like the Samsung Galaxy S2, and the display is exceptional. The richness of colours and contrast on the screen makes viewing videos and pictures a peerless experience, and WP Mango’s live tile interface makes the best use of the display. The bright and colourful interface looks good even outdoors with the Lumia 800. The 8 MP camera on board might not be the best in its class—both the Galaxy S2 and the iPhone 4S give better results in low light conditions. The built-in camera app for Mango, though, is one of the easiest to use, with a dedicated camera button that can take photos even when the phone is locked, and comes with built-in image editing tools similar to the highly popular iPhone app Instagram. Taking pictures on the Lumia is also extremely fast, and it’s not likely to disappoint buyers, but it won’t wow them either. The Lumia definitely looks great and works well—but is the OS going to help or hinder its adoption? For first-time smartphone buyers, Windows Phone is an excellent choice. The app selection is narrower than that of Android or iOS, but almost every major app from both platforms is available for Windows Phone users already. Unlike early adopters of Android, WP users have plenty to choose from. Connecting the phone to your computer, syncing and managing the device storage are all simple tasks for any Windows user. The interface is also the first major departure from the iOS bed of tiled icons. While it needs a little micromanagement to keep everything organized, the layout is easy to use and fairly intuitive—contacts and messages, for instance, integrate your phone, email and social network communications into single tiles. These tiles act as widgets that constantly update with the latest activity right on to the home screen, seamlessly. All these features are also what might keep people away from the device—it’s such a big change from the way you use your phone that it takes a lot of getting used to. The Lumia is a sophisticated smartphone that melds its hardware beautifully with the Windows Phone OS. The phone will officially become available mid-December, with the price expected to be around ₹ 29,000. If you’re already using a Nokia handset running Symbian, and want to know a bit more about the Windows Phone OS and the features of the Lumia 800, then you can download the free Nokia Lumia 800 app from the Nokia Store. The app shows a virtual handset so you can look at the device and explore the Windows user interface, and get an interactive tour of the Windows Marketplace and other aspects, such as the new Internet Explorer, Menu and People interfaces.